The Electoral Commission (EC) will next week announce the names of those eligible to contest this year’s presidential and parliamentary elections after the two-day filing of nominations closed on Friday. At the EC Headquarters in Accra, the Returning Officer for the presidential election and Chairperson of the commission, Mrs. Charlotte Osei, said at the close of nominations, 17 presidential aspirants had successfully filed their nominations. Following that, she said, the nominations will be vetted, after which those who passed the eligibility criteria will be announced, to be followed by balloting for positions on the ballot paper. Some 23 nomination forms were picked by the various political parties and independent candidates when the EC opened nominations on September 13, this year. Presidential aspirants of six political parties and two independent aspirants yesterday filed their nominations to contest the presidential polls, bringing the total to 17, as nine presidential aspirants had submitted their forms to the EC last Thursday. The parties whose presidential aspirants filed their forms yesterday were the Progressive People’s Party (PPP), the Unity Development System Party (UDSP) and the Great Consolidated Popular Party (GCPP). The rest were the People’s National Convention (PNC), the Convention People’s Party (CPP) and the Democratic People’s Party (DPP). The independent aspirants were Jacob Osei Yeboah (JOY) and Kwame Asiedu Walker. In spite of the successful closure of nominations, there were a number of interesting scenarios that took place at the EC, the first occurring when the PPP filed for its presidential aspirant. The National Chairman of the PPP, Nii Allotey Brew-Hammond, submitted Dr. Papa Kwesi Nduom’s nomination forms to the EC Chairperson and added a banker’s draft for GH¢50,000 as filing fee. However, the EC Chairperson refused to accept the filing fees from the aspirants, however, accepted Dr. Nduom’s filing fee and refused to return it to Mr. Brew-Hammond when he asked for it to be returned. She said the PPP knew the legal implications of having brought the filing fee yet decided to do so, for which reason she would not return it. Mrs. Osei later told the media that for her, the payment of the filing fee by the PPP was an indication that the party had decided to withdraw the case it filed in court against the filing fee. She, however, did not accept filing fees from any other aspirant. 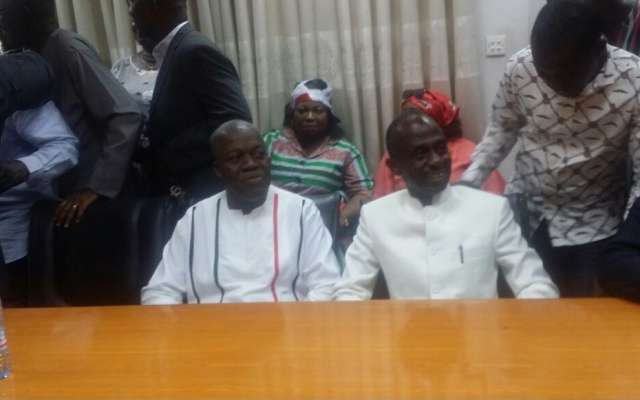 Mr. George Boateng, the man who had wanted to contest President John Dramani Mahama for the flagbearership of the National Democratic Congress (NDC) but was disqualified, stormed the office of the EC holding a set of presidential nomination forms. He said he had come to the EC on behalf of a presidential aspirant whom he named as Mr. Lawrence Nketiah Kutin and that he had sent a petition to the EC to ask for an extension of time, since they had picked the nomination forms just three days to the deadline. Mr. Boateng also claimed that the petition was also about the fact that the EC, according to the laws of Ghana, had no right to charge any filing fee. He was initially asked to write the name of the presidential aspirant but he appeared confused and could not write the name, insisting that he had to speak to the EC Chairperson. When he finally had the chance and asked Mrs Osei about the petition, she said she had not received any petition. Mr. Boateng then left the offices of the EC, looking quite disappointed. One other issue of concern was the disability unfriendliness of the EC office, evident in the fact that the presidential aspirant of the CPP, Ivor Greenstreet, had to be lifted from his wheelchair and carried to the second floor of the EC office before he could access the venue for the filing of the nomination. The last party to file for its presidential aspirant was the DPP, led by the veteran Mr Thomas Ward Brew, who was at the EC offices at 4:25 p.m. without his nomination documents. His reason was that the forms were with his running mate, Mr Oto Otoo, who was putting finishing touches to the documents and hoped that Mr. Otoo would arrive at the EC offices before the close of nominations. Mr. Ward Brew sat and waited with bated breath until 4:50 p.m. when his running mate appeared with the forms, after which they successfully filed the nomination. Why has the N.P.P performed so poorly in Ga-Damgbe areas?